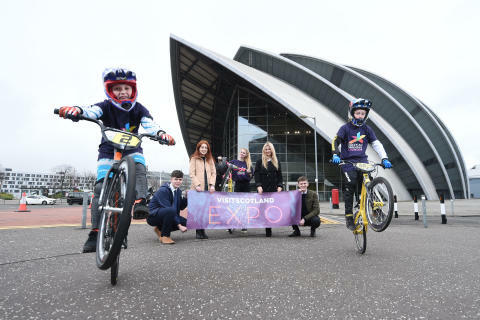 VisitScotland is gearing up for this year’s Expo with help from some of Scotland’s rising BMX stars. The national tourism organisation is exporting Scotland to the world with the flagship event which will see around 600 tour operators and travel agents from over 30 countries – including the USA, Japan, Brazil, Russia, the UAE, Saudi Arabia and Germany – meeting over 300 Scottish tourism businesses. VisitScotland Expo is also celebrating the Year of Young People this year with the premiere business to business event being held in Glasgow ahead of the European Championships taking over the city and venues across Scotland later this year.Youngsters Harrison Bell, 10 and Elijah Shearer, 11, and Molly Shearer, 16, joined forces with Modern Apprentices from the organisation to launch the country’s biggest travel trade show. VisitScotland Expo – which kicks off tomorrow [WED 11 APR] at the SEC - will welcome hundreds of exhibitors, including accommodation providers, visitor attractions and activity providers, from every corner of the country, showcasing their products and services to buyers from the UK and across the globe. Enthusiasm amongst businesses is high with the event hosting the largest number of exhibitors in 20 years - up from 276 last year and welcoming around 80 new businesses. The show is marking YOYP2018 by putting the power in young people’s hands with Modern Apprentices and Graduates from VisitScotland judging the shortlist for VisitScotland Expo’s Stand Awards which will then be handed out to exhibitors with the best stands over the two-day travel extravaganza. A global first, Year of Young People 2018 is a platform for young people aged eight to 26 years old to have their voices heard on social issues, their talents showcased and their contribution to communities celebrated. Glasgow 2018, which includes BMX racing as part of its cycling events as well as Aquatics, Golf, Gymnastics, Rowing and Triathlon, expects attendances at venues of around 250,000 this August - bringing a welcome boost to the local economy. Riders Harrison, Elijah and Molly, from Western Titans BMX club in Clydebank, Glasgow, who will train at the new £3.7 million Olympic standard BMX facility at Knightswood following the Championships, are already scoring top titles at a young age and the trio dream of qualifying for the European Championships in the future. Malcolm Roughead, Chief Executive of VisitScotland, said: “It’s wonderful to see young people at the forefront of Expo and the Glasgow 2018 celebrations. 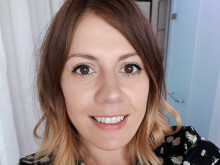 “Glasgow is the perfect setting this year for VisitScotland Expo, as the city alone acts as a gateway to the rest of the country and I am sure many of the buyers here will be impressed to see Scotland punching above its weight on the world stage when it comes to tourism and events. “We need to leverage this reputation to bring new investments, new events, new airlines and new visitors and Expo gives all Scottish tourism businesses the chance to promote their products and services to tour operators and travel agents across the globe – all under one roof. Glasgow 2018 Championships Director Colin Hartley said: “Glasgow is set to make sporting history later this year when we stage the first ever combined European Championships, using our proven excellence, expertise and warm welcome to create a must-attend and memorable experience for tens of thousands of visitors, athletes, media, spectators, officials and residents. This year’s VisitScotland Expo will be the 39th staging of the event which began as the Scottish Travel Fair in 1980 before being rebranded in 2002. The 2018 event welcomes some of the world’s biggest tour operators, including online, niche, accessible, active and adventure providers. VisitScotland Expo helps businesses achieve international growth and has a net economic impact of £2.5 million on the local economy.